Be the first to share your favorite memory, photo or story of Mrs. Savanah . This memorial page is dedicated for family, friends and future generations to celebrate the life of their loved one. Mrs. Savanah "Big Nanny" Butler, age 95, of Dallas, Georgia, passed away on Monday, February 4, 2019 at her residence. Savanah was born on August 23, 1923 to Dewey Roland Lawrence and Irene Frances (Sosebee) Lawrence. 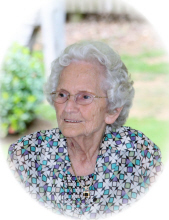 She enjoyed cooking for her family and friends, quilting, and serving others. She was a member of Pumpkinvine Baptist Church for 74 years. Prior to her passing, she worked as a seamstress for Paulding Hospital. She was preceded in death by her husband, Ernest Clarence Butler; her grandson, Infant son of Janice and Ned Cole; her son-in-laws, Ned Cole, Bill Blount and Danny Wallace; her parents, Dewey Roland (Irene Frances Sosebee) Lawrence; her brother, Dewey Lawrence and her sisters, Edna Huff, Cornelia Strickland, Mary Barber and Vernell Ragsdale. Savanah is survived by her daughter, Janice Cole Blount; her daughter, Sandra Wallace; her daughter, Kathy (Tom) Ray; her grandchildren, Jimmy (Jennifer) Cole; Jeff (Maureen) Cole, John (Laura) Cole, Nancy (Steve) Abrams, Greg (Michelle) Blount, Gary Blount, Casie (Jason) McClung, Joseph Wallace, Jason (Kirsten) Wallace, Jerry (Laura) Wallace, Kim (Kevin) Williamson and Tommy (Wendy) Ray; 24 great grandchildren; 7 great great grandchildren; her brother-in-law, Sam Ragsdale; nieces and nephews also survive. Funeral Services for Mrs. Butler will be held on Thursday, February 7, 2019 2:00PM at Benson Funeral Home with Rev. Thomas Cole, Rev. Jimmy Cole and Rev. Tommy Ray officiating. Interment will follow at the Peaceful Meadows Memorial Park. The family will be receiving friends on Wednesday, February 6, 2019 from 5:00PM - 8:00PM and Thursday, February 7, 2019 from 12:00PM - 2:00PM. All visitations will be held at Benson Funeral Home. In lieu of flowers, the family wishes for donations to be made to the Pumpkinvine Baptist Church Building Fund 2156 Buchanan Highway Dallas, GA 30157. To send flowers or a remembrance gift to the family of Mrs. Savanah Butler, please visit our Tribute Store. "Email Address" would like to share the life celebration of Mrs. Savanah Butler. Click on the "link" to go to share a favorite memory or leave a condolence message for the family.